Clearly we missed this bad boy for a long while. 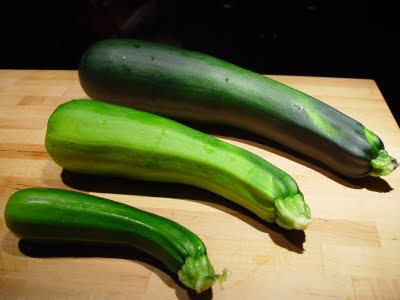 I'm not sure if you can appreciate how big this big zucchini is, even with my stellar photographic skills. The little one is "normal" size, the middle one is a bit big and the biggest one is 19.5" long and 4.25" in diameter at its widest point. If I could weigh it, I would but I don't have a food scale. It probably won't even taste good at this size, but I had to get this on record. I decided not to let Alex take the picture for fear it would (somehow, some way) find its way into an NC-17 rating. Preheat oven to 350 degrees. Spray 13 x 9 pan with cooking spray. Beat eggs. Add cheese, squash and onions. Spoon into greased pan and spread out. Pour scalded milk over ingredients evenly. If using butter, mix with stuffing (or bread crumbs). Spoon stuffing mixture evenly over the squash. Bake for 30 minutes or until brown and bubbly around the edges. If you like your squash mushy, cook another 5-10 minutes. Serves 10-12 people as a side dish. Holy smokes another two weeks has passed me by. We've been busy entertaining friends for Hersheypark outings and have family coming this weekend to celebrate my son's birthday (4th). So I was grocery shopping today in an effort to be an organized and prepared hostess. Ha. So I started picking up every bottle of Ranch dressing on the shelves and, lo and behold, every single one had MSG in it, even Ken's "Healthy Options" Ranch, which I find really misleading. There was no Newman's Own Ranch anywhere, which is another good option. Wishbone and Kraft and all those mainstream brands all had MSG, among other lousy ingredients in them. I bought Nature's Promise Organic Ranch Dressing. I can't find any product info online, but it seems to be MSG-free and generally all ingredients you know and love. One word of caution with the Nature's Promise items (and organic items in general, especially if you live somewhere this "trend" isn't hot): Always check the expiration date. One time, I bought NP Caesar dressing that was a year old and didn't realize it. Not cool. While I'm on my soapbox about discontinued organic/natural items at Giant, I also could not find the Organic Savory Herb Stuffing Mix from Arrowhead Mills. This stuff is delicious, plus it made my cheesy squash casserole SO much better than bread crumbs. I'm going to have to get over to Wegman's and see if they have a better selection, or maybe try the Giant in Camp Hill, which seems to be better stocked with organic-leaning items. If anyone wants the casserole recipe, let me know. It's basically zucchini or summer squash (which we have now in overabundance), milk, eggs, cheese, onion, butter and stuffing (my way, anyway). It's super quick to throw together and really yummy. And you can modify (skip butter, use skim milk and lowfat cheese) to be healthier. I've been a little quiet on the posts. Shame on me. I've been doing a lot of reading and participating in social media. It's fun...and time-consuming. Anyway, in my travels, I'm come across some brands I've never heard of before and also report on some of my favorite products right now. Please comment if you've got any favorites I should try. First, a site I just found through their Facebook ad: sweetpeaproducts.com. They don't have the best website or lots of products, but they do have something called boo-boo balm that is free of harmful chemicals and seems to have quite a loyal following. And it's only $6. Gotta get me some of that, especially considering my boys' tendencies to acquire boo-boos. Their gift basket would also make a very nice shower gift. The founder is an infant massage practitioner, so she has a massage oil and a book on how to massage your infant in the basket. This can be especially effective in soothing fussy babies. Second, a lot of new alcohol-free hand sanitizers seem to be cropping up. I use CleanWell, both the wipes, which are great for the diaper bag, and the spray, which I keep at work. It smells a little, well, antiseptic, but it's got no triclosan and no alcohol and it's proven to work. My friend, Cobie, turned me on to Grandma Minnie's Hand Sanitizer because she tired of using Giovanni's expensive lavendar-scented wipes. I have not tried this stuff, and it's $30 a bottle! Also, it contains alcohol and triethanolamine, which scores a "6" in the Cosmetics Database. I also shy away from lavendar for my boys, after reading that it *might* be an endocrine disruptor. That research from 2007 has been disputed, however new research has come out just last month on this topic. Read my post about the Endocrine Society's report. I'm really loving a Korres summer beauty promo package I bought with Face Primer, Watermelon Tinted Foundation SPF 30 and Bronzer (though I've used this the least of the three). I already use their Ginger & Vitamins Foundation SPF 10 and love it. And their mascara is great. Though it's gotten quite gloopy the longer I've had it, which is not long. Still, it's easy to wipe the wand off as I'm pulling it out and it doesn't clump on my eyelashes. Also liking my NVEY ECO Organic Erase and my Tarte Cheek Stain. 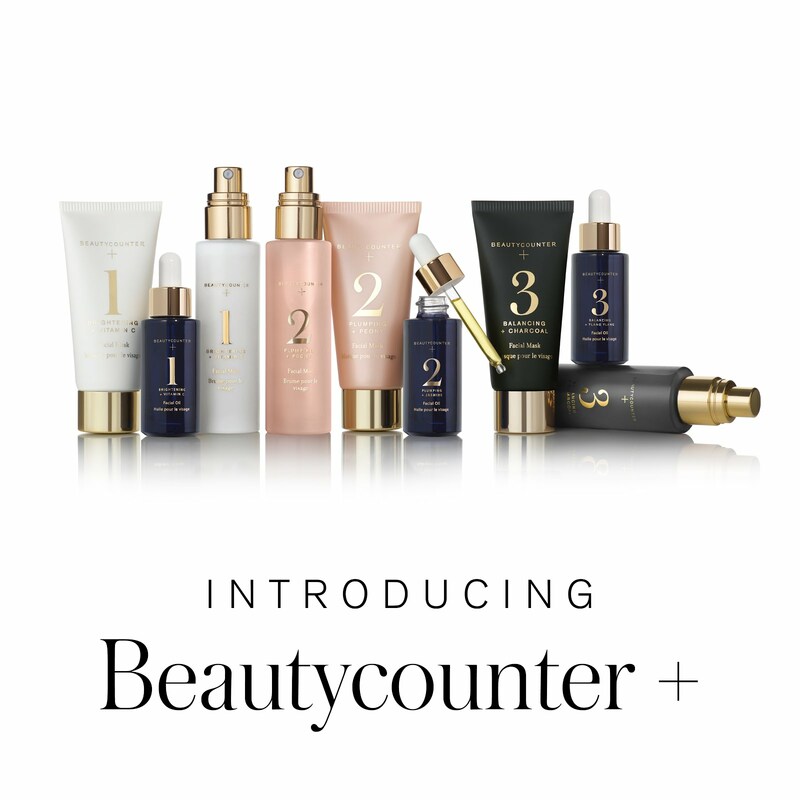 These all happen to be available at Sephora, which is convenient. They have lots of "natural and organic" products, but some are better than others, so be sure to read the description and ingredients. Another thing I'm loving is Bubble & Bee's Pit Putty. I cannot say enough good about this product. If you've tried a natural deodorant before, it probably didn't work. Now, I'm not a super sweaty person, and this is not an antiperspirant, but I don't find that I sweat much when I'm wearing it, plus, it does deodorize the pits. It's white and it can get crumbly if the stick gets too warm, but I don't mind as long as it works and I'm not putting aluminum on my body. They also make a Geranium Lime Spray Deodorant that is quite nice and tucks neatly into a purse, as a refresher or backup or "oops, I forgot my deode this morning" (which happens to me!). This product is not officially launched, but you can get it with the "buy two" deal. It's really very lovely smelling. I've also tried the Bubble & Bee Root Beer Lip Balm, and it's yummy and emollient. I also got an Orange Organic soap, and while I liked it, we went through it too quickly for the price, so I'm going back to my basic big olive oil bar soap. I plan to try their hair products and the Geranium Lime Pit Putty when this one runs out. Thanks, Stephanie, for a great bunch of products! In Endocrine-Disrupting Chemicals: An Endocrine Society Scientific Statement by Evanthia Diamanti-Kandarakis, Jean-Pierre Bourguignon, Linda C. Giudice, Russ Hauser, Gail S. Prins, Ana M. Soto, R. Thomas Zoeller and Andrea C. Gore, published in June 2009, we learn that endocrinology researchers are alarmed at the potential consequences of overuse of these chemicals. Here is an excerpt from the abstract: "There is growing interest in the possible health threat posed by endocrine-disrupting chemicals (EDCs), which are substances in our environment, food, and consumer products that interfere with hormone biosynthesis, metabolism, or action resulting in a deviation from normal homeostatic control or reproduction. In this first Scientific Statement of The Endocrine Society, we present the evidence that endocrine disruptors have effects on male and female reproduction, breast development and cancer, prostate cancer, neuroendocrinology, thyroid, metabolism and obesity, and cardiovascular endocrinology. Results from animal models, human clinical observations, and epidemiological studies converge to implicate EDCs as a significant concern to public health." Unfortunately you have to pay to read the full text, but Fanatic Cook has a great blogpost on this. Scary stuff, and I'm glad they are going on record to alert the public and lawmakers to this public health threat.